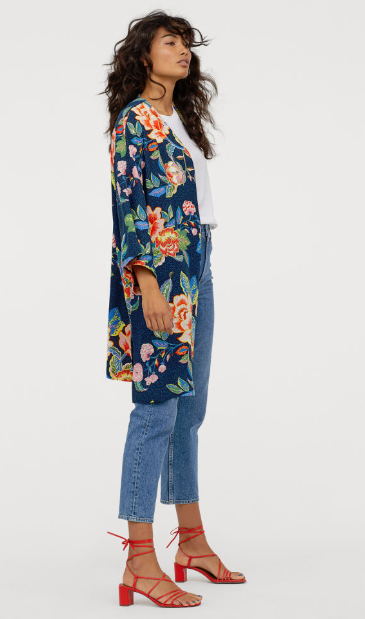 We found this spring coat on the high street for under €30 and the number of ways we'll wear will reach the hundreds for sure. I have a spring coat I bought in H&M a few years ago that I break out every year. It is not a 'coatigan' or a 'shacket' but it's not a coat per se. I can't describe it as a coat coat because I wouldn't wear it in winter to protect me from the cold. But I would definitely wear it in spring or even summer when I need something that's not a jacket. But not a coat. Five fashion pieces you need when you hit 30. This spring coat (let's just call it that) is the 2019 version of the one I bought all those years ago. My one had a white base and a black palm tree print which made it useful but not as useful as you'd think. I wanted to wear it a few times as part of a wedding guest outfit, you see, but found it wasn't quite right. I can see myself wearing this one to all the occasions - and with jeans and a t-shirt, too. The kimono style makes it flattering on all body shapes and sizes and the multiple colours gives you more versatility than not. I can see myself wearing this with a pale pink dress and matching shoes, for instance. And H&M style it for a casual occasion perfectly with their jeans, plain white tee, and orange low-heel sandals. Even though the print is bold, it looks to us like a piece you will return to numerous times over the years. 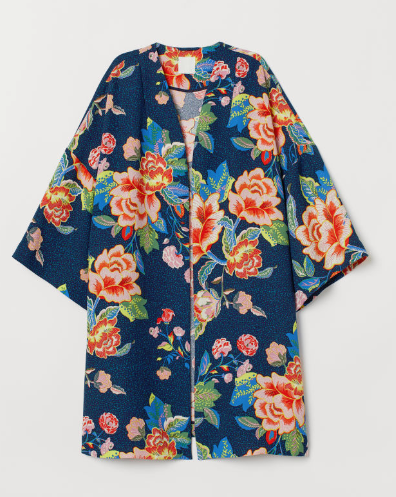 The kimono style will never go out of fashion, and it will be a handy piece to turn to when you have 'nothing to wear.' You could even wear it under and not instead of a coat in winter. What do you think of this spring coat? Do you think it's worth having pieces like this in your wardrobe?